Home Organizing News Solidarity Actions: Together we are Union Strong! Solidarity Actions: Together we are Union Strong! National Grid locked out 1,250 gas employees across Massachusetts when their contract expired on June 24. See Boston Globe coverage of the lockout and its terrible impact on workers and families. 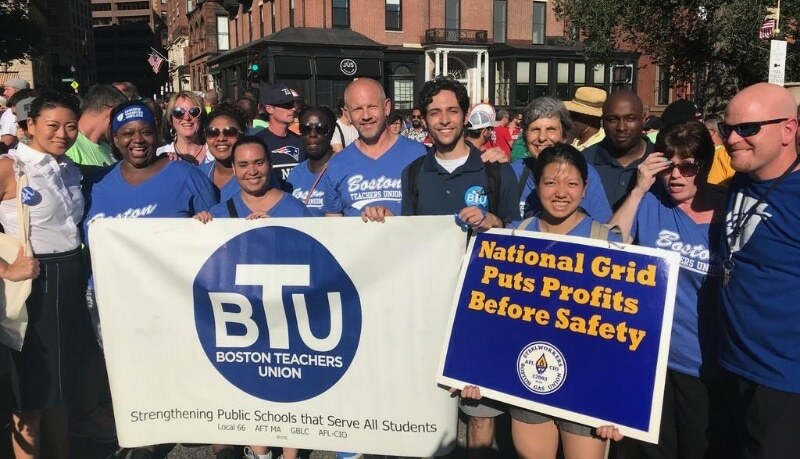 Last week BTU members and officers joined in a solidarity rally demanding the National Grid end the lockout. We continue to support their fight for safety and respect! Follow their local, USW #12003, on Twitter, and check the #EndTheLockout hashtag for updates. The AFT Massachusetts updates us on the unfolding situation in Chelmsford in a statement from President Beth Kontos. Last November, then-president of the Chelmsford Federation of Teachers Jen Salmon and AFT MA field representative Eric Blanchet were removed from the Harrington Elementary School by the police, which clearly violated the law. Last month, the Massachusetts Department of Labor Relation found probable cause to hold a hearing on 17 of the counts included in the complaint the AFT MA filed immediately following the initial incident. Read and share Beth’s full statement, and stay tuned for updates from AFT MA on Twitter and Facebook. NEW — Tomorrow, Support Public Defenders’ Right to Unionize! Show your solidarity with public defenders and other Committee for Public Counsel Services (CPCS) staff by joining them tomorrow, Thursday, July 26 at 1 PM at the State House. CPCS staff have been working for many years without a voice in their terms and conditions of employment. Although they receive most of the benefits provided other state employees (pensions and healthcare), they do not currently have the right to collectively bargain. Read more and stop by tomorrow! Please join us from 3-6 PM on the 5th floor of Boston City Hall for a PILOT (Payment In Lieu of Taxes) Hearing. The BTU has been a big part in researching and advocating for a review and revision of Boston’s PILOT program which asks our universities and hospitals to contribute more to the city. We believe there are critical improvements to be made in collections and community benefits that would benefit our schools, housing, and healthcare. Please join the BTU and advocates from the PILOT Action Group coalition for a hearing on the status of the program! RSVP by emailing Jonathan at jrodrigues@btu.org.